Are you engaged in and excited about innovations that make global high speed networks faster, more secure OR the emerging “Wireless Mobile Services” made possible, SUCH AS immersive healthcare/commerce, internet of things, self driving cars, Smart Cities or virtual reality? 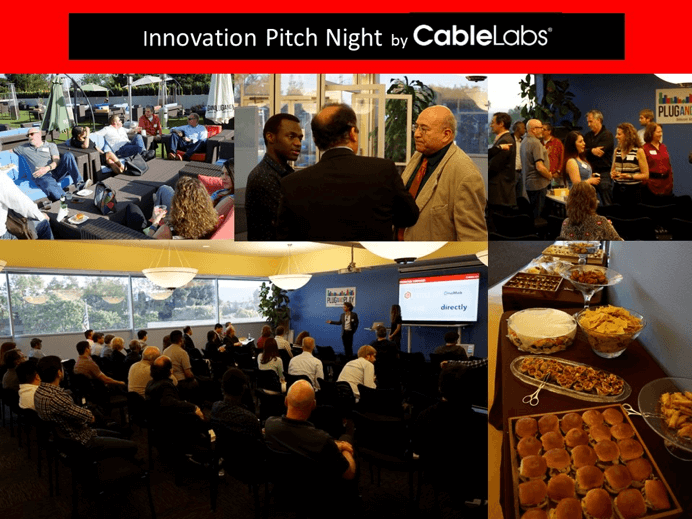 Then, join CableLabs and members of the local entrepreneurial and innovation community to witness 4 SELECT early/mid stage companies pitch their compelling ideas to an EXPERT panel of investors and innovation mentors. You’ll have the opportunity to watch, contribute & learn during this LIVE experience and vote for the company you believe will have the most impact in our world. And, you’ll have the chance to connect and join lively conversations with the entrepreneurs, innovation mentors and investors in a casual environment. We are excited for you to join us at the Plug and Play Tech Center in Sunnyvale, CA: located at: 440 North Wolfe Road, 2nd Floor - Game Room! Did you know that the cable industry invests $250B in developing and deploying innovations that are at the heart of the digital experiences we all rely on and enjoy? Come check out what new ideas are being considered, join the conversation, and connect with those interested in taking this work forward. SIGN UP EARLY and SIGN UP NOW! LIMITED number of seats available for this event! Please share this event with others that you know are thoughtful and eager to participate in innovation, such as individuals in the wireless mobile services/tech industry, entrepreneurs, VCs & Angel investors active in Networking, iOT, VR, Smart Cities or Healthcare.